When you talk about the British capital the word carnival is not the first that comes in mind, but surprisingly there are many annual festivals in London. They are colourful, with lovely music and tropical feel. If you just relocated in the capital and you are wondering what to do with your free time, why not look up some of London’s most notable carnivals? If you like to dance, eat exotic food and have fun, go to Southwark Park in London in June. Carnival de Cuba is one of biggest free annual, summer events that take place in the capital. You can go mingle with the most talented Salsa dancers from the most famous Salsa clubs in London, taste traditional Cuban food and have a great time. Carnival de Cuba is the biggest event celebrating the Cuban culture in Europe. There are all kinds of small events accompanying the festival that you can also take part in. 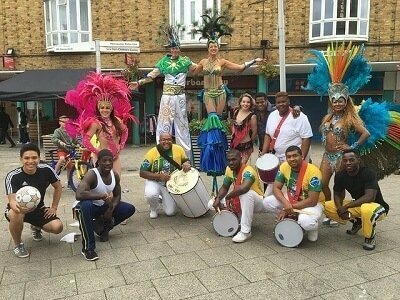 Dance workshops, wine and food tasting, face painting carnival and open salsa lessons, you name it, Carnival de Cuba has it! It is sunny August, and you want to go out of crowdy London for a while, why don’t you visit Hythe Venetian Fete held every two years on the Royal Military Canal at Hythe in Kent. A procession of extravagant and colourful floats, great music, a lot of food and games, this is what a true water carnival should look like. The tradition of the Hythe Venetian Fete comes back from the 1860s Hythe Cricket Week and it is loved by every British family in the small town of Hythe. The most surprising thing about the carnival is not the peculiar floats but the fact that everything is planned, organised and run by volunteers who just want to keep the old traditions alive. The Luton Carnival is the largest one-day carnival in the UK. Thousands of people come every year to witness the bright costumes, passionate dances and vibrant music of the performers. Over twenty different groups play Caribbean music and there is always a famous guest star. Carnivals are all about having a fun time with your family, especially if you have kids. There are various different rides and activities, and you and your family will feel like you are visiting a tropical paradise in the middle of the UK. Notting Hill Carnival is the oldest carnivals that celebrates the fascinating Caribbean culture and traditions. Every year during the August bank holiday Monday and the preceding Sunday, close to a million people gather in Notting Hill to take part in this unique for the UK event. Men and women put on colourful costumes and dance through the city streets under the Caribbean rhythms. Visitors from all corners of the world take pictures, try traditional food and enjoy the celebratory atmosphere. This is one of the most anticipated events throughout the year, and usually, the good watching spots are reserved fromÂ early in the morning. Celebrated during the first week of August every year, Carnival del Pueblo is the biggest European outdoor event celebrating the Latin American culture. Every Summer colourful floats, musicians in beautiful traditional clothing and dancers in extravagant costumes make their way from London Bridge and Borough High Street, to Burgess Park. The carnival attracts more than 50 000 people every year. El Carnival, how it is mostly known, gathers in one place the fascinating culture and traditions of all nineteenth Latin countries. If you happen to have a house moving in the summer months, definitely go and visit London’s, Burgess Park. 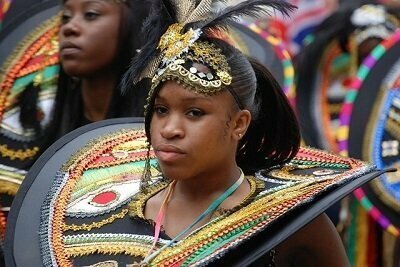 After the long house moving process, why not surprise your family by bringing them to this London Carnival. You can try various amazing cuisines and traditional beverages, as well as learn some flashy dance moves.